It cannot have escaped your notice, if you are in the UK, that there is a lot of fuss about this year’s World Book day £1 book offering. The problem centres around the fact that four of the books are by celebrities and one is a Marvel Comic. Librarians and authors have been incensed by this, pointing out that in the past these WBD books have been successfully promoted as tasters, and children have gone on to read and love the authors represented – authors such as Malorie Blackman, Cressida Cowell, Robert Muchamore, David Almond to name but a few. This article from the Guardian sums up the situation perfectly. I know my Facebook feed and Twitter feed have been full in the last couple of days of people really angry about the fact that WBD isn’t about encouraging children to read books by excellent children’s authors, but seems to have fallen prey to the cult of celebrity instead. This isn’t a new thought. There have been questions about Zoella’s book club before, with opinion divided on what her choosing criteria are. But this is different. First World Book Day is turned into Dressing up Day – mostly by primaries and often nothing to do with books – and now there are fears that World Book Day is becoming just another outlet for already overexposed celebrities. What do you think? Do you think it is harmless, that children should just read? or do you support the authors who feel that their talent is being degraded by celebrities writing children’s books because, after all, how hard can it be? 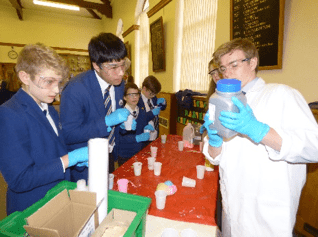 Very hard – judging by the Carnegie and Greenaway Award Winners! 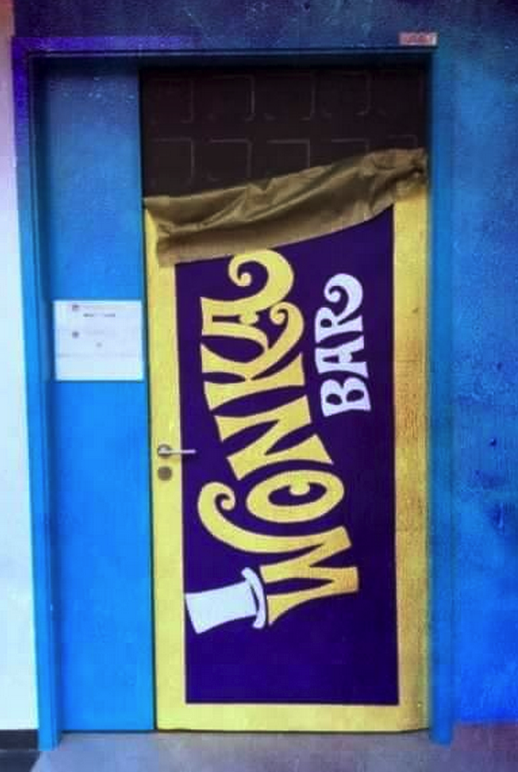 ‘Each year the Director of Literacy and myself choose a theme relating to the wonderful world of books and hold a “Festival” for two weeks around World Book Day. The aim of these festivals is to not only promote literacy but to allow students to use a variety of other skills including creative thinking and problem solving. So this year’s theme needed to be even bigger and better and after a lot of deliberation we chose the Harry Potter series, turning our Academy into Hogwart’s to hold a Tri-Wizard Tournament. It certainly was the best festival so far. 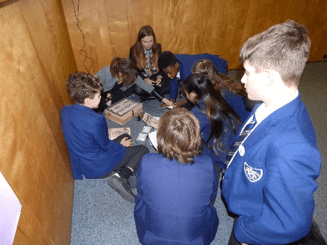 We held a series of challenges including a Horcrux Treasure Hunt, Quidditch Cup, Magical Spelling Bee and Wizarding Trivia Duels, as well as setting a task for each tutor group to prepare a series of relics. The relics included designing their own wizarding school, a founder’s wand, school uniform and a Marauder’s map. 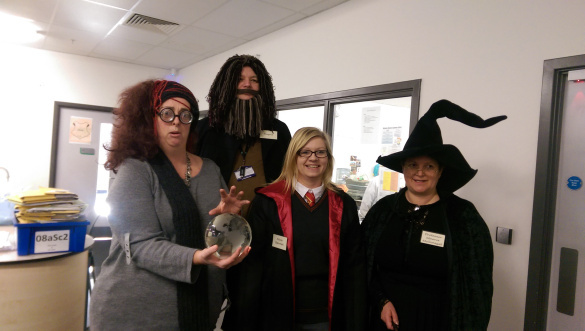 Students competed for points for their tutor group and of course the glory of becoming a wizarding champion. 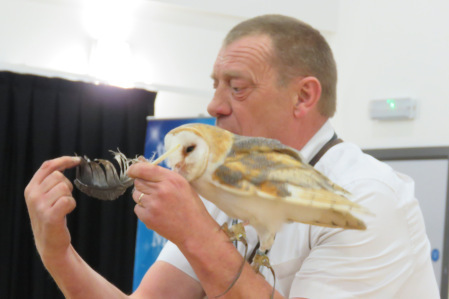 We also held a Care of Magical Creatures Workshop for KS3 students with Eagle Heights bringing along their birds of prey (eagle, hawk, peregrine falcon and owl). 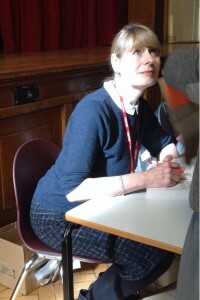 The fantasy author Sara Grant was also invited along to hold Creative Writing Workshops. Once again we have been nominated for the most engaging book week theme so fingers crossed. For more in depth detail of our event please see below. 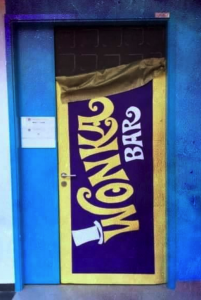 Classroom doors were also decorated for the theme of Book Week, and you can see the fantastic results on the Flikr stream. At lunchtime the Library was filled with year 7 girls making bookmarks, doing quizzes, and watching author videos specially filmed for WBD. There was also a book swap, and an opportunity for students to exchange their vouchers for some of the WBD books. Librarian Annabel Jeffery tells about World Book Day at her school. Sounds fun! In an assembly which celebrated the importance and joy of reading our younger pupils were entertained by two video clips which focused on the value of reading (one of which featured popular author John Green). Fourth form tutors and Library staff then joined together on stage to read out in turn inspirational (and moving) quotes about books and reading. Elsewhere in school some of the MFL and Classics staff were keen to take the opportunity to read to the pupils. For example ‘Pablo diablo’ (Horrid Henry) was read in Spanish, and ‘Die kleine raupe Nimmersatt’ (Very hungry Caterpillar) in German! Classics staff also read their favourite myths and extracts from fiction set in Roman times. 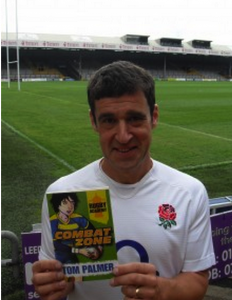 On World Book Day, Thursday 5th March, a day full of sporty reading took place with visiting author Tom Palmer. An energetic Year 6, 7 and 8 all joined in with the reading football game which was a massive success, with prizes for all the winners. The buzz of books and reading echoed throughout school while the sound of the penalty shoot out could be heard loud and clearly from the Library Annexe. Head of Library, Mrs Dewhurst was delighted with the week saying ” we’ve had a lot of events taking place this week – we wanted to give everyone the chance to join in, making it a whole school book week. 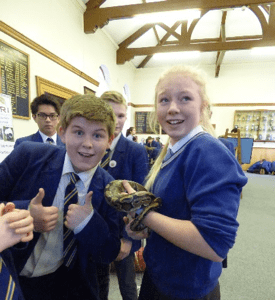 It takes a lot of planning to put a book week together, but absolutely worth it – to see just how many students got involved this week has been fantastic. The author session was the icing on the cake and extremely touching to see the love and passion for books shine through , and the enthusiasm from Year 6 was breathtaking with over forty Tom Palmer books being sold! The lunchtime book signing session was extremely popular with students queueing with their books, footballs, sportswear – all for signing. The author really did ensure every student left happy. 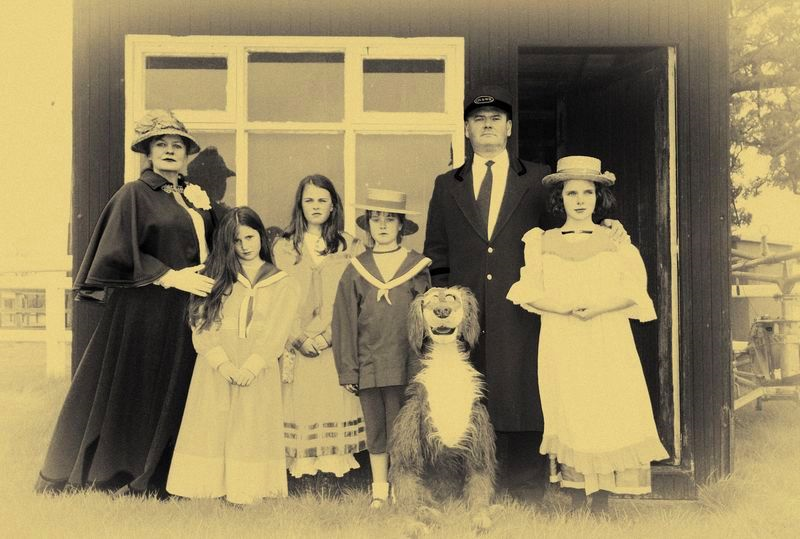 World Book Day 2015 – what did you do? 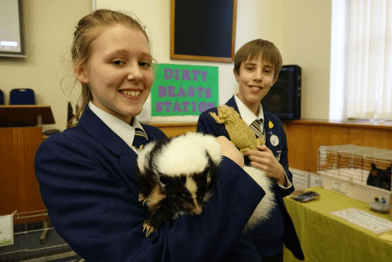 On Thursday 5th March year7&8 pupils from Lightcliffe Academy in West Yorkshire celebrated books and reading in style by travelling to Preston for the flagship World Book Day event. There were 5000 students at the event and the atmosphere was electric! We saw 5 authors including Cathy Cassidy who inspired us to use our local library and told us that daydreaming is a great way to come up with stories. 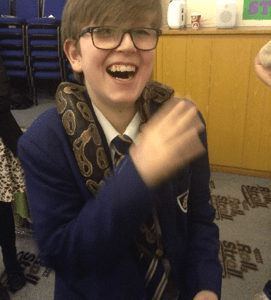 Cressida Cowell showed us how to DRAW a dragon and Danny Wallace made us all laugh. As a final treat, all students received a signed copy of a book by their favourite author. 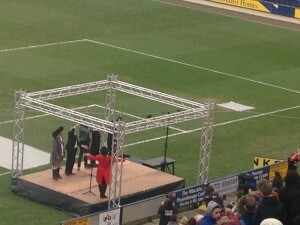 It was definitely worth the two-hour journey to get there! What did you do in your school that was special? Let me know and I will either post it here, on Facebook or tweet it. Let’s celebrate all the wonderful work we do! “Each boy (I am librarian at an all-boys state school) wrote the title of their favourite book or books on a leaf. I then added these to a Book Tree Display. The staff did the same on coloured flags which formed the border of the display. 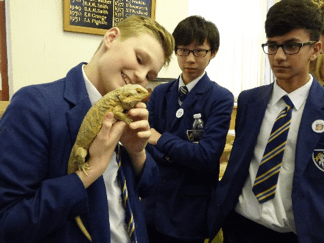 Last year, Backwell School Librarian, Anne Gibson was chosen to give Ness’s The knife of never letting go to teachers at her school (knowing they have little time to read for pleasure and concerned that they didn’t know how far teenage literature has come). Inspired by the runaway success of her actions (just about all teachers returned to the library desperate to borrow the following two books in the series and saying they had passed the book onto family and students) she decided to tackle 6th formers this year. Thrilled to see Matt Haig’s The Humans on the list, she encouraged four teachers to join her in applying to be “givers”. Each chose their favorite title which they also thought would appeal to 6th formers who are rarely seen reading for pleasure about school. 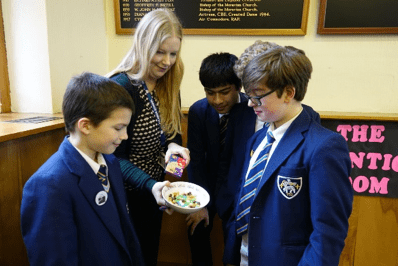 She publicized the lunchtime event on the common room plasma screen and assembly on the day, setting up a display with sweets to encourage takers in the common room. Unbelievably, 10 minutes later it was all over! The only things left on the stand were a few sweets! Two weeks later and students are telling staff what they enjoyed and who they have passed their book onto. 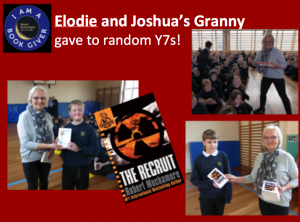 Anne also received a surprise call from Elodie and Joshua’s granny asking to “give” WBN book, The Recruit by Robert Muchamore to boys in school as her granddaughter had told her that they are not keen readers! 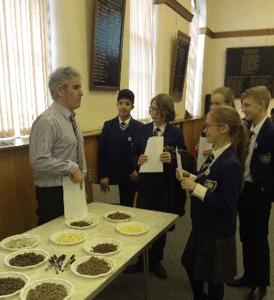 Mr Conkie’s marvelous Random Generator was used during a Y7 assembly to choose lucky recipients, both boys and girls (as we couldn’t think of a fairer way!). Library staff have noticed Robert Muchamore’s books disappearing from the shelves as a result and one girl told us she was borrowing for her Mum!! Next year Anne is planning to ask staff to be Community Givers, by donating a book from their own library to students in their tutor groups or houses. She aims to package them attractively to heighten interest. (Brown paper bags and badges are going to feature!) This will leave more books on the website for you to apply for. She thoroughly recommends having a go and encouraging staff and students to share and talk about books. The effects will last for weeks. 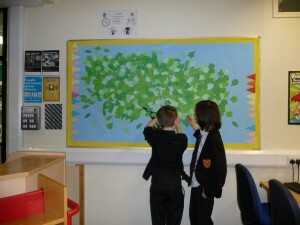 If you want to see more about Backwell School’s reading journey, visit their fantastic blog.